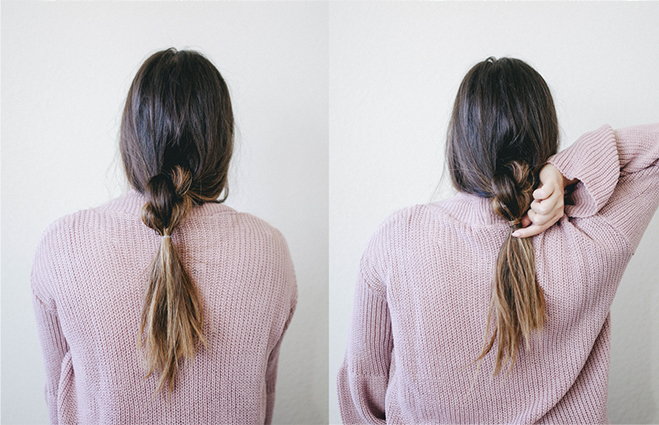 This knotted ponytail is the easiest thing ever. It takes about two minutes to do and I can't stop wearing it, especially when I want to look like I put in some effort. Ok, let's get started. 2. Separate all of your hair into two equal parts. Feel free to leave small sections of hair out to frame your face like I did. 3. With the two sections of hair, make a knot exactly how you would on the first step of tying your shoe. Pull tight. 4. Make a second knot doing the exact same thing, except start with the side you didn't use last time. Pull tight. 5. Secure the end with an elastic. Pull out each section gentle until you are happy with the result. You can also opt to not pull out the sections and it will look like THIS. 6. 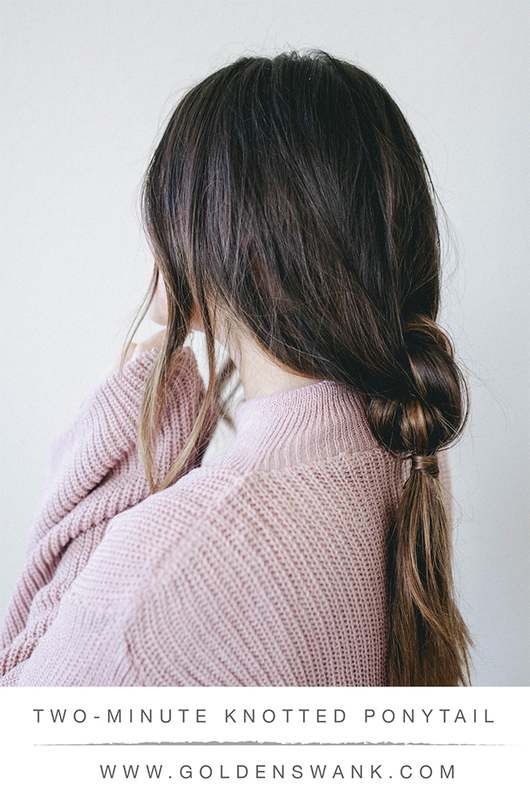 To hide the elastic, wrap a small section of hair around the elastic and secure it with a bobby pin on the inside of the ponytail. This is stunning!! 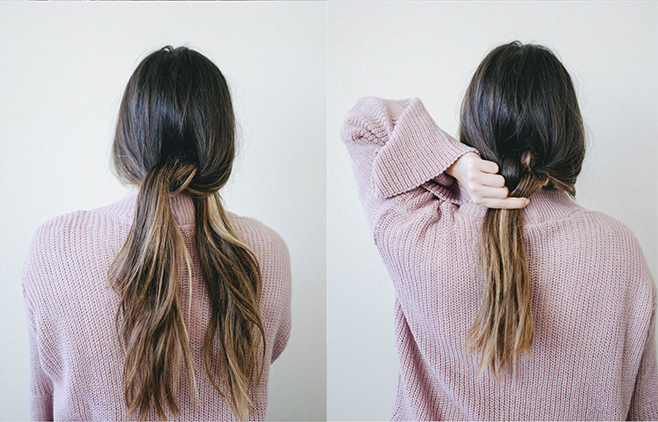 I need to try it with my shorter hair! i've never tried it with shorter hair before but i'm sure you'll rock it! you may need to start higher up on your head so you have enough hair for the knots! LOVE it and looks easy! I'll have to try! I want to be as good with hair as you are! yay! you will look bomb. hands down. Ooh, super easy and super cute! And your hair is so gorgeous! Excellent tutorial! I love you hairstyle. I absolutely love the style, so chic! This is so beautiful! I love that it's messy, but elegant all at the same time. 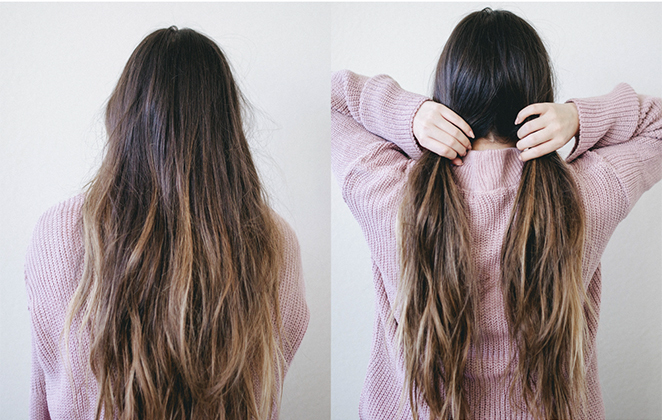 I can't wait until my hair is longer so I can try it! I love it! Doing this tomorrow!